Today is our official first day of summer vacation. . . Or the part of the year I dread the most. Don't get me wrong, I love my kids, but the first few days of vacation are always the worst. The kids are fighting: me, chores, and each other. This year is presenting a special challenge since the kids are a lot older and they've spent most of the school year completely plugged in. From friends to school work, they've had to be on the computer all the time. And in our house, we love our tech gadgets. The Boy had some challenges this school year because tech is so tempting for him. And Little B? He's taken to waking up before everyone else so he can have total access to the computer. Leelee sticks on her headphones and gets sucked in to Tumblr fandom. It wasn't so bad during the school year when they had homework, but without a set school schedule, it is so easy to sit back and get sucked in to the endless abyss of the internet. You've certainly heard of detox. In our house, the kids are going to de-tech. Tech access is going to be earned. But first, it has to be taken away. Unplug. For real. Take away the cords, the mice, the game controllers. Unplug the WiFi. It's a hard first step. Lock it up. Hide it. I don't know about yours, but my kids will look for it. But what to replace it with? 1. Tech with a purpose. Let the kids access sites to blog or find activity ideas. There's a good chance you'll "see" my kids guest blogging for me. 2. Summer reading programs. I'm glad my kids love to read. There are some big movies coming out based on books. We're all going to be re-reading our favorites. . . like Ender's Game. 3. Gardening. The garden needs tending every day. No one wants to weed the whole thing, but each person take a small part. With three distinct gardening areas, there's plenty to do. 4. Camp. Even if it's camping in the back yard, kids love to sleep in tents. Three of mine will be going to sleep away camp this summer. Just for a week, but it's amazing how much the household dynamic changes when you remove just one kid! We are also planning a big family camp out at the beach. Check your local state parks for camping options. I may tent camp, but I don't go anywhere without showers and real toilets. 5. Swimming and splash pads. Our house is located halfway between a YMCA and the city's splash pad downtown. My big kids love to go to both. 6. Local museums or zoos. It's really too hot here to go to the zoo in the summer, but we have plenty of free museums! 7. Service Projects. Whether its walking dogs for the humane society or just mowing the lawn for an elderly neighbor, it's important for kids to have opportunities to give back. The Boy will be working on his Eagle Project this summer, with Little B helping. Leelee volunteers at a horse therapy camp. 8. Homework. Even though it's summer, there's still homework. Three of the kids have major projects due the first day of school! 9. Board games. Or as I like to call them bored games. As in "Mom, I'm bored." I have a jar of chores they can pick from or they can go play a game! Ok, now let's get to the practicalities of it all. These ideas are great, but they are all based on two things: Having a schedule and keeping to the schedule. The kids wake up before I do and are free to read and watch TV quietly. Cutting back on the tech is a hard step for us. We aren't quite ready to be TV-free, too! Around 10 a.m. is the morning snack. Chores are done before lunch. If rooms are clean and chores are done, after lunch, we select an activity. It can be the park, swimming, crafting...pretty much something to stay busy. By 2 p.m. the kids are getting hungry again so it's time for another snack. The afternoon snack is the fun snack and may require a bit more prep. I'll be sharing some of those adventures. Late afternoon is hot. It's miserable. The little ones and the teens usually end up taking a nap and waking up for dinner. Little B and Danger Girl are suddenly left alone with mom. Whining gets them extra chores, so it's their turn to come up with activities and things to do. Danger girl has a big homework portfolio we need to get a jump on. This is also the perfect time for everyone to play a game. After dinner, there are more chores to do and a garden that needs watering once the temps start to drop. I let the kids run through the sprinklers during the garden time. Or we may head back to the pool. We end up having different family theme nights, too. Family Home Evening on Mondays. Family Game Night. Family Movie Night. Midweek Church Activities. 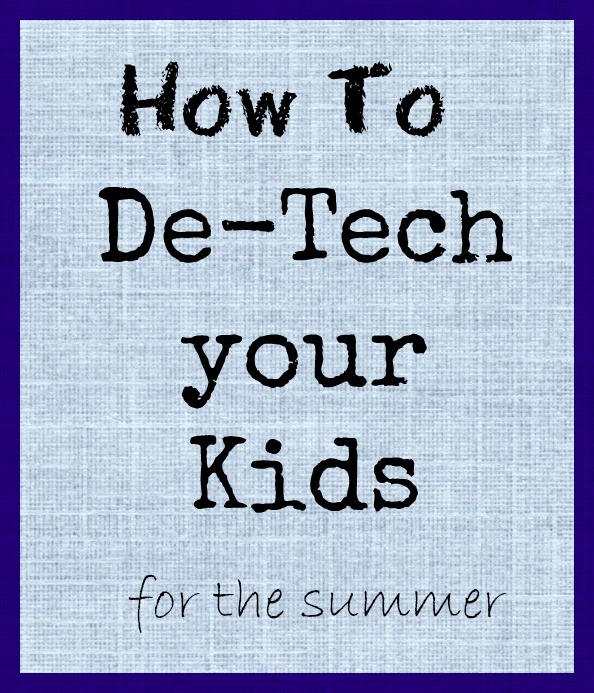 With everything that has to be done this summer, it's a wonder the kids are going to have any time to get on to tech at all! I'd love to hear your great ideas for de-teching this summer. Leave a comment and I'll be updating this list with your great ideas. Sounds like a plan. I hope the kids don't do too much whining about being de-teched. Time at the beach and the pool sounds perfect for the summer heat. these are all great tips and one's that I will incorporate into our summer schedule. I implemented "screen time" which can be anything they want for a certain period of time each day. So far so good but then to they have only been out of school for a week. The Blog Workshop was awesome! Vintage Frame Wreath...from Restoration Redoux!